These healthy Rice Krispies treats are made with creamy peanut butter. Turn them into a healthy Valentine snack by cutting out heart-shaped treats. No one will miss the marshmallows! Lightly coat an 11 x 13-inch baking pan with nonstick cooking spray. In a large bowl, combine Rice Krispies and raisins. Set aside. In a microwave-safe bowl, combine peanut butter, maple syrup, honey and margarine and microwave on high for 1 minute. Remove from microwave and stir. Pour peanut butter mixture over Rice Krispies mixture. Stir to coat the cereal and raisins. Using your hands, press mixture into pan. Refrigerate for 2 hours or overnight, covered. Using a heart-shaped cookie cutter, cut 16 treats. 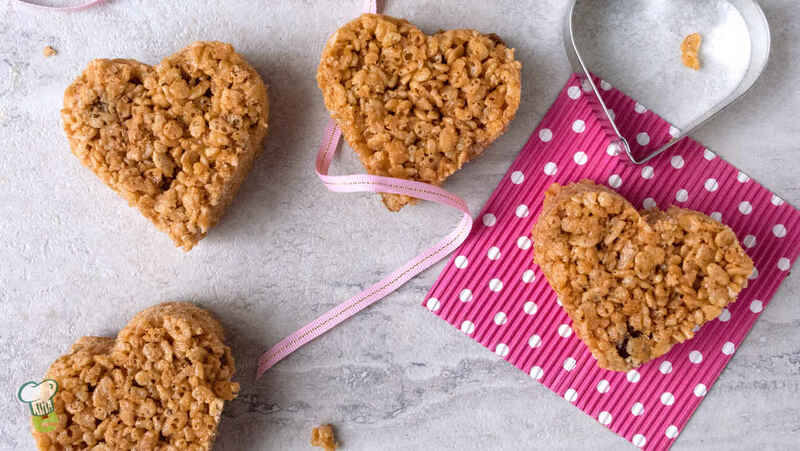 Keep Rice Krispies hearts refrigerated until ready to serve. Copyright 2017-2018 © Baldwin Publishing, Inc. All rights reserved. Health eCooking® is a registered trademark of Baldwin Publishing, Inc. Cook eKitchen™ is a designated trademark of Baldwin Publishing, Inc. Any duplication or distribution of the information contained herein without the express approval of Baldwin Publishing, Inc. is strictly prohibited.